Sally. 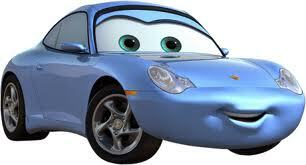 McQueen's love interest. Wallpaper and background images in the Disney Pixar Cars club tagged: wingo sally lighting mcqueen cars. you know when i made her in human form i drew her with blonde hair cause she'll look cute and pretty with blonde hair.